Children are a very important part of the Church of the Resurrection parish family, and they are welcome at all worship services. We believe that by participating alongside of adults in worship, even if they do not understand everything that is going on, children are nurtured in the deepening of their faith journey so that it will continue to grow in richness and depth into adulthood. Most importantly, we want children to know that they are loved, accepted and valued at Church of the Resurrection in worship and in all aspects of community life. Formal worship can provide an excellent opportunity for parents to be involved in the spiritual nurture of their children. Talk with them about the service. Explain what is happening. Help them catch your enthusiasm and happiness about being in church. We suggest that parents sit at the front of the church so that children can see what is happening. There is also a children’s area at the front of the church complete with activities, scribble sheets and coloring supplies. 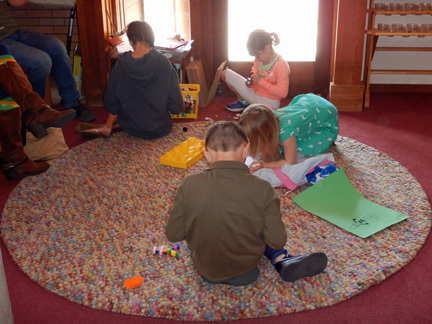 Chiidren are welcome to sit with their parents in the pews or to read books and color in our kids corner at the front left of the sanctuary, where they have a clear view of everything that takes place at the altar. Every five weeks we offer a children's and youth service which is designed especially for the young people of our community. Our worship is lively and kid-friendly and is often punctuated with the laughter and chatter of our community's kids.